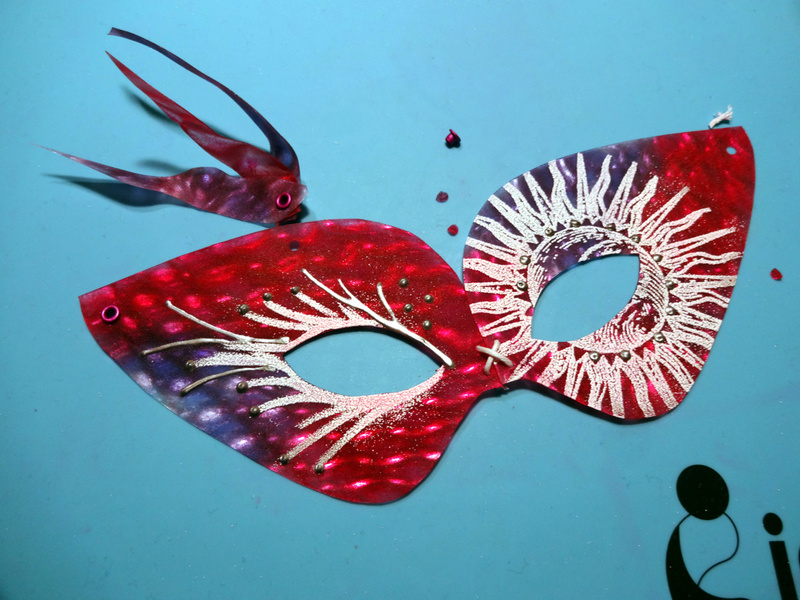 Celebrate Mardi Gras this year with a gorgeous and festive handmade mask. Vertigo sheets are a great tool for making amazing visual effect when light hits it and it’s always more vibrant when color is added. 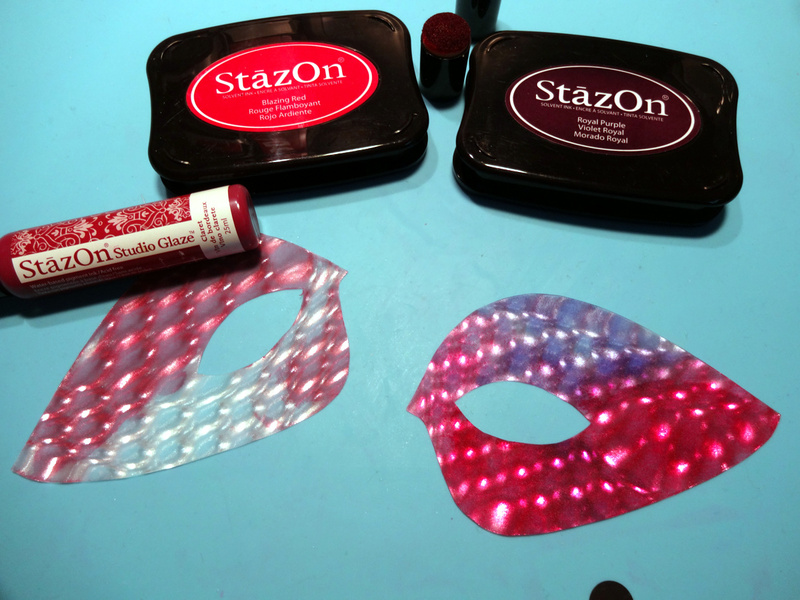 Using the StazOn ink pads you can assure that the colors mix well on the Vertigo sheet and will not fade. Imagine’s Embossing Powder also provides a detailed decoration for this project that is iconic of the celebration of Mardi Gras. Enjoy! 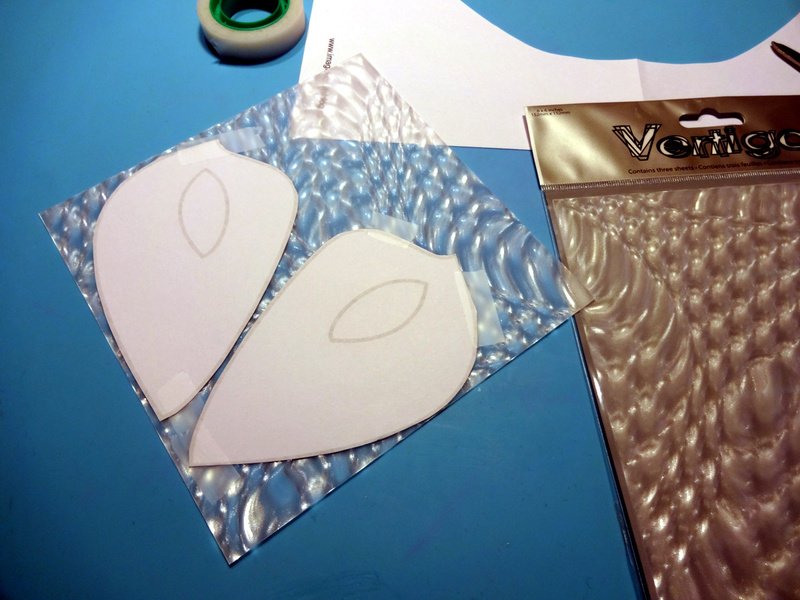 Print the mask template, cut along and secure it on the back of a Vertigo Sheet using masking tape. 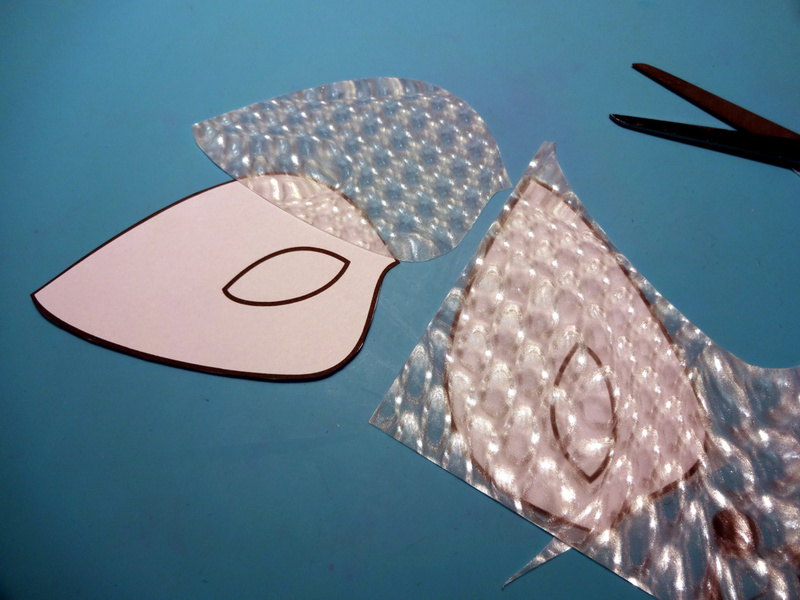 Cut along the mask pattern. 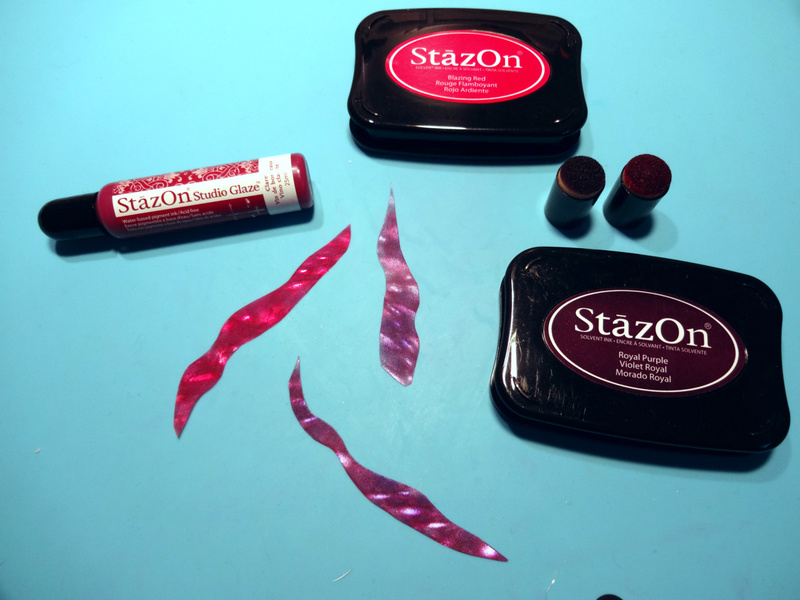 From the remaining Vertigo sheet, cut wave shaped stripes between 3-4 inch and color with the StazOn Blazing Red and Royal Purple. Using your heat gun and a pair of tweezers, heat the Vertigo stripes and twist. Partially cover the Vertigo mask pieces with StazOn Studio Glaze. Continue to color with the StazOn Blazing Red and Royal Purple inks. 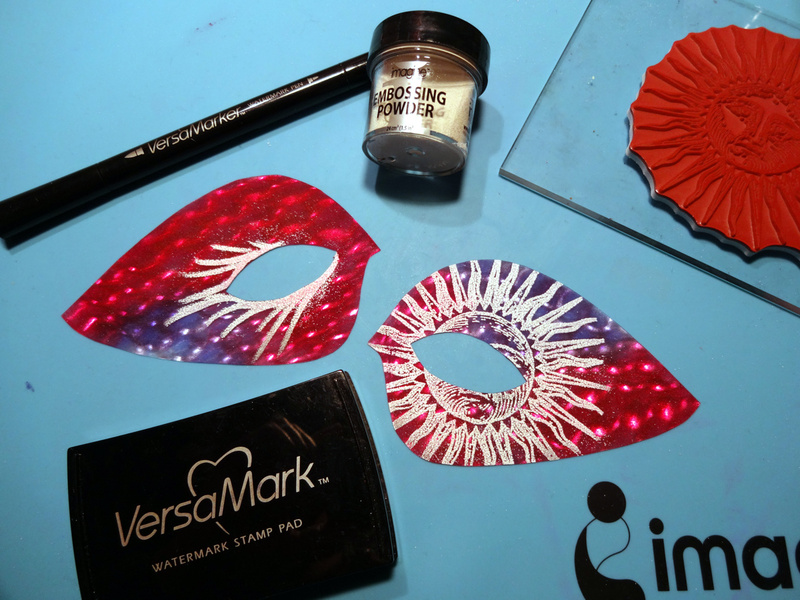 Stamp the sun design on side of the mask using the VersaMark inkpad. Decorate the opposite side by hand using the VersaMarker. Cover with Imagine’s Embossing Powder in White and heat set. 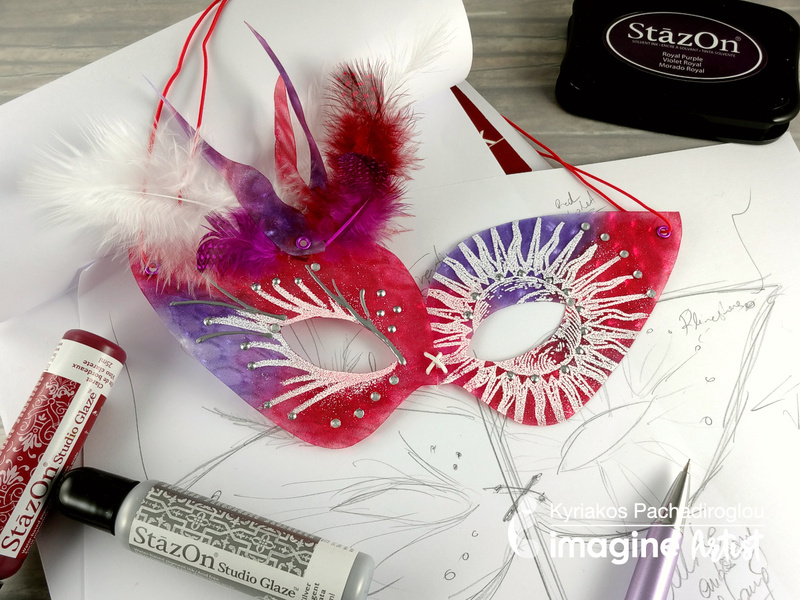 Decorate the mask with the StazOn Studio Glaze in Silver, making lines and dots. Pierce holes on the mask inner sides and hand tie with the cord. 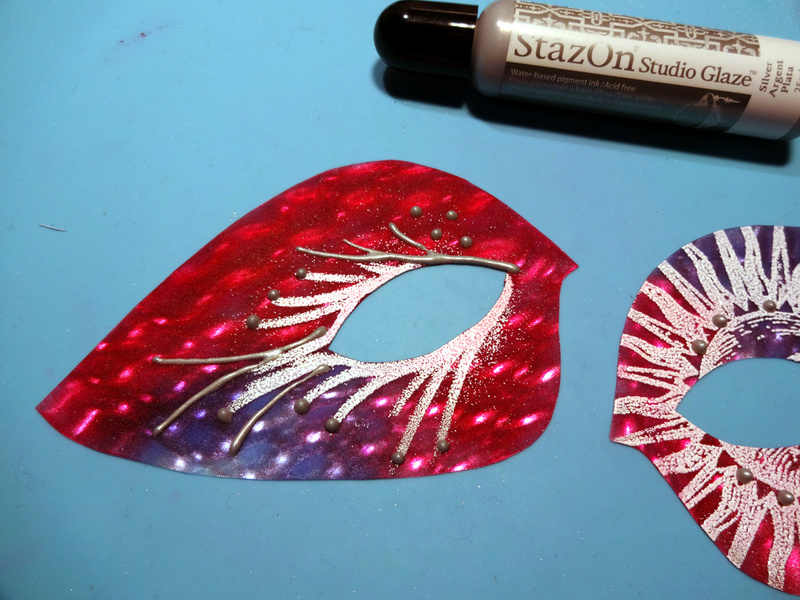 Punch holes on the Vertigo stripes and attach them with an eyelet on the mask. 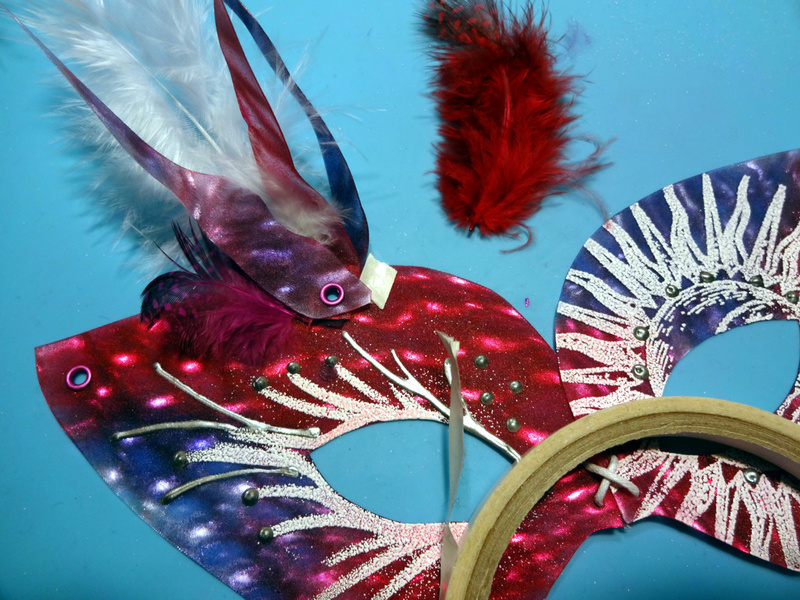 Add eyelets on the ends of the mask to tie later the elastic cord. 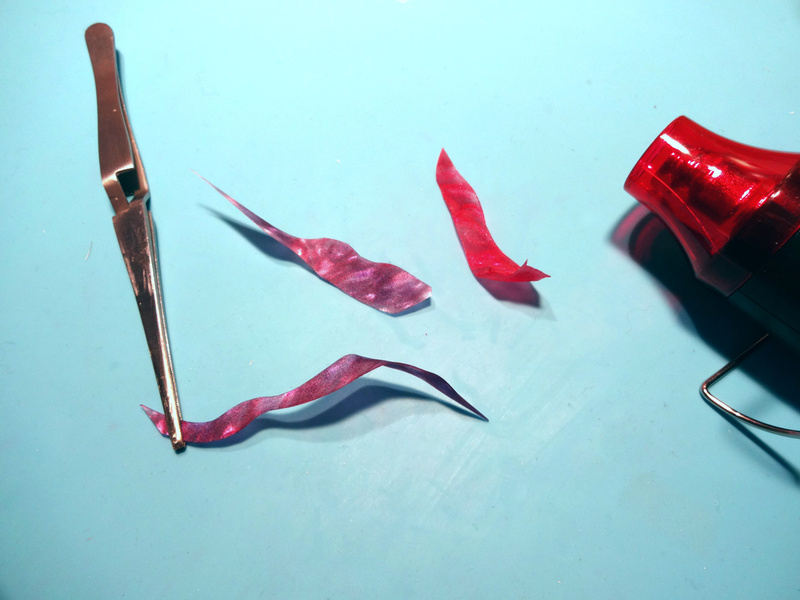 Use small pieces of Tear It Tape to glue feathers close to, previously attached, Vertigo stripes. 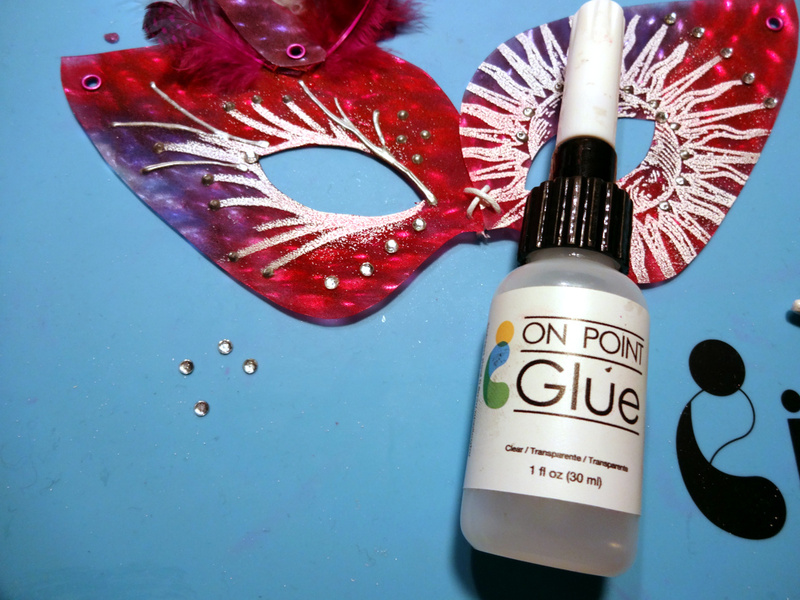 Add rhinestones by gluing them with On Point Glue. And finish the mask by adding the elastic band to the sides. 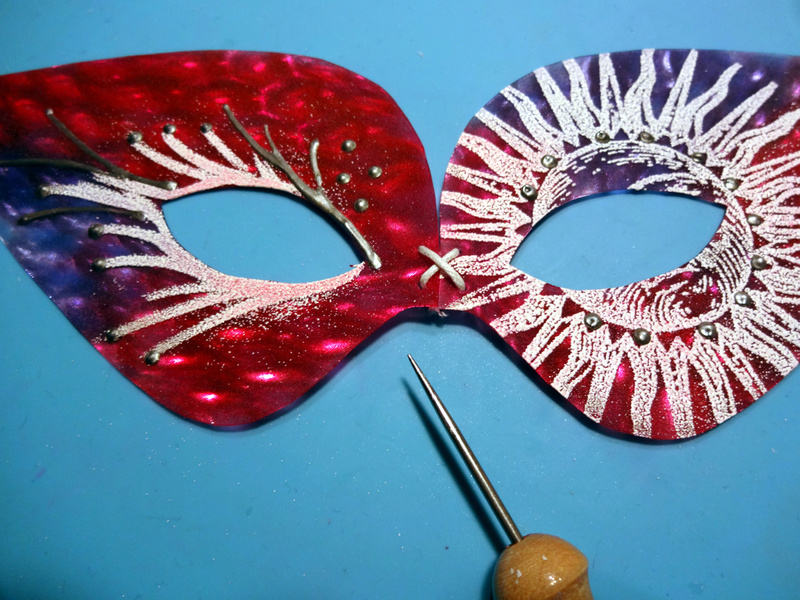 This entry was posted in 2018 ARTIST IN RESIDENCE, DIY, Holiday, INSPIRATION, Kyriakos Pachadiroglou, Lifestyle, Mixed Media, PROJECTS, Techniques and tagged Crafting, Crafts, DIY, DIY Inspiration, Embossing, Embossing Powder, Handmade, INSPIRATION, Mardi Gras mask, Mixed Media, StazOn, StazOn Studio Glaze. Bookmark the permalink.